A classic machine for Sega games. Similar to Nintendo's NES Classic and SNES Classic, Sega revealed that a Mega Drive Mini will be coming to Japan to celebrate the 30th anniversary of the original console. The news came from the Sega Fes 2018 event which featured a number of announcements and celebrated the company's history. Although details are sparse, we know that it will have pre-loaded games on the machine, a form factor of about a quarter of the original size, and a release date sometime this year. As for which games will fill its roster, that remains to be seen. There is currently no word on a North American or European version. The Mega Drive, known as the Genesis in North America, came out in Japan in 1988 and featured several great games like Sonic the Hedgehog, Phantasy Star IV, and Streets of Rage II, just to name a few. 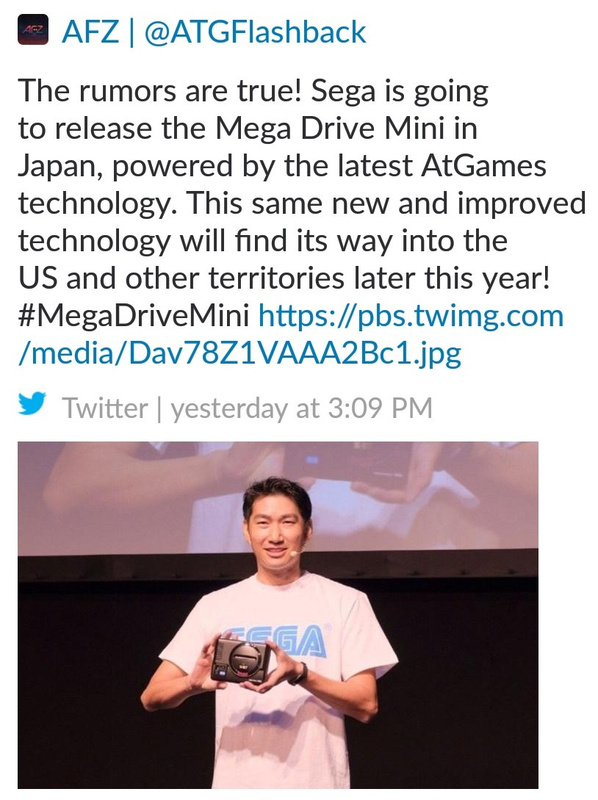 The official AtGames Twitter account said that it is tasked with creating the Mega Drive Mini, although the tweet was subsequently deleted. AtGames is a licensed manufacturer of retro Sega hardware, but its previous Sega Genesis Flashback console was received poorly. "Mega Drive Mini" (tentative name) announced for 2018. While reproducing the design of "Mega Drive" released in 1988 30 years ago, it results in the size of about 1/4. You can enjoy by just connecting to the TV. Details such as the specific release date and title will be announced at a later date. Sega Fes 2018 came with plenty of other news, like a port of Shenmue I and II coming to PlayStation 4, Xbox One, and PC sometime in 2018. A number of classic Sega games are also set to roll out for the Nintendo Switch throughout the year; five games are coming this summer. Of course, the most important news was the fact that Persona 5: Dancing Star Night will have DLC costumes from the Yakuza series.